Creating virtual-hardware PC and running the original W32 binaries including their boot-loader etc. Disk device access would be passed as virtual IDE disk (=hard disk drive). File access API would be implemented either by special escaping by some trapped instruction out of the virtualmachine while using W32 file access API or using the standard W32 SMB (Server Message Block) network access through some virtual network card. The latter network access solution is almost the currently available possibility of running full-blown disk-sharing real Microsoft Windows NT inside virtual machine emulator such as VMware. pros: Full compatibility due to fully native codebase. cons: Hard to debug, missing documentation of NT booting internals, possible problems by different PC virtual-hardware than expected by NT, requirement of fully installed Microsoft Windows NT product. This solution was chosen by the project. Binary filesystem driver and also ntoskrnl.exe binary file are required. Unfortunately ntoskrnl.exe expects a native PC virtual-hardware missing during regular UNIX user space process emulation, therefore such instructions must be trapped and emulated/ignored from case to case. Also the initialization code of ntoskrnl.exe is not executed by this project since it expects to get full PC hardware access privileges and thus some datastructures do not get initialized by it (need to be trapped later at runtime stage). Some of the missing initializations are solved by API functions wrapping. pros: Lightweight, easier to debug. cons: Possible incompatible emulation of ntoskrnl.exe parts, missing documentation needed for the implementation. Unlike previous method here we do not use even ntoskrnl.exe as the complete kernel part of W32 is emulated from the project source files. cdfs.sys driver was successfuly ran in this manner in the former versions of this project but the possibility to run without ntoskrnl.exe was dropped since it had no licensing gains (you need the original Microsoft Windows NT files at least for the filesystem driver itself) and the emulation of undocumented parts reusable from ntoskrnl.exe binary was a pain. cons: Possible incompatible emulation of the whole ntoskrnl.exe, its missing documentation. During the initial point of the project development all the API functions were defined as unimplemented, of course. Any call of such unimplemented function is fatal and results in program termination. When we need to implement any required API function we have multiple choices to do so: Direct pass to original ntoskrnl.exe, Wrap of the original ntoskrnl.exe function, Native implementation – $ReactOS, Native implementation – $Wine or Native implementation – project specific. This security is almost the same as provided by emulated virtual machines such as VMware. Project can be also used in non-sandboxed mode by --no-sandbox option as it is easier to debug without CORBA/ORBit RPC. In this case the DirectorySlave/FileSlave options are used directly instead of their DirectoryParent/FileParent peers. Library is called patched if we require loading its original binary code file. Project needs to patch it to be able to trap all the function entry points. The only currently patched library of this project is ntoskrnl.exe. Library is called unpatched if no original binary code is needed since all of its functions are completely emulated by the native implementations of this project. The typical unpatched representative is hal.dll as it specializes on the hardware dependent code and therefore it must be completely replaced by this project running in the GNU/Linux operating system environment. Early versions of this project had also full unpatched native implementation of ntoskrnl.exe but it no longer applies. Original Microsoft Windows NT architecture uses two address space areas – user space and kernel space. User space is mapped in the range 0x00000000 to 0x7FFFFFFF, kernel space is mapped in the range 0x80000000 (KERNEL_BASE in ReactOS sources) to 0xFFFFFFFF. All these virtual memory ranges represent addresses after their MMU (Memory Management Unit) mapping, of course. More discussion can be found in the description by Microsoft. This project runs in the virtual address space used both for the UNIX user space process part and for the W32 kernel space. Therefore this project defines that W32 kernel runs in the whole range 0x00000000 to 0xFFFFFFFF since there are no special mapping assumptions about the UNIX user space process mapping. No W32 user space exists in this project. Such approach also nullifies any special memory moving operations between W32 kernel space and W32 user space memory areas (such as MmSafeCopyToUser()). Using -fshort-wchar GCC option and strictly differentiate between compilation of ReactOS code and UNIX code. pros: No source modifications needed, no runtime performance hit. cons: No type checking if some part of code has bad compilation flags, complicated way to completely split ReactOS and UNIX code. Wrap all ReactOS literal constants by some conversions function call (implemented as macro REACTOS_UCS2() by this project). pros: Any forgotten/mistaken conversions are type-checked and warned during the compilation by GCC. cons: All compiled ReactOS sources files containing literal wide strings have to be wrapped/modified, performance hit by runtime string conversions. This solution was chosen to get the internal sanity checking benefit. The native W32 binary format is identified as PE-32 (Portable Executable 32-bit), such files have all the usual extensions such as .sys, .exe, .dll etc. PE-32 loading support was already implemented by ReactOS, its memory mapping specifics just had to be ported to GNU/Linux environment by this project. This loading support does not (yet) cover importing of debug symbols from W32 .PDB (Program DataBase) files in GNU/Linux ABI (Application Binary Interface) compatible way. Be aware of some differences if you use PE-32 binary format file vs. .so format file. PE-32 use the appropriate W32 specific cdecl/stdcall/fastcall call types, .so must be completely compiled in the standard UNIX cdecl call type semantics. Native function implementations do not need to be explicitely exported by captivesym as they are resolved automatically by the UNIX dynamic system linker. It may be surprising you will have to fix all such missing symbol exports if you advance during the development from the debugging .so file for the production version of the original PE-32 binary file. The project technically supports only one (exactly one...) mounted filesystem device and only one filesystem driver. There is nothing complicated to support multiple disks and multiple loaded filesystem modules but as they would share the address space it would only bring a possible complications during bug reports and the bug solving itself. It was considered as a more sane way to support multiple W32 mounted disks by completely separately running project instances in a different UNIX processes communicating from their sandboxes via CORBA sandbox interface. This sandboxing feature is not yet deployed although its code is already prepared. The project also does not support any state cleanup to be able to load filesystem A, cleanup A and load a different filesystem B in the same process address space. It complies with the preventions of the possible debugging complications as noted above. Despite this you still must call the function captive_shutdown() to flush all the pending filesystem buffers to the disk. After calling captive_shutdown() the process address space is no longer usable for any further project operations and the process is expected to be terminated in the manner compatible with its driving CORBA sandbox interface control master. 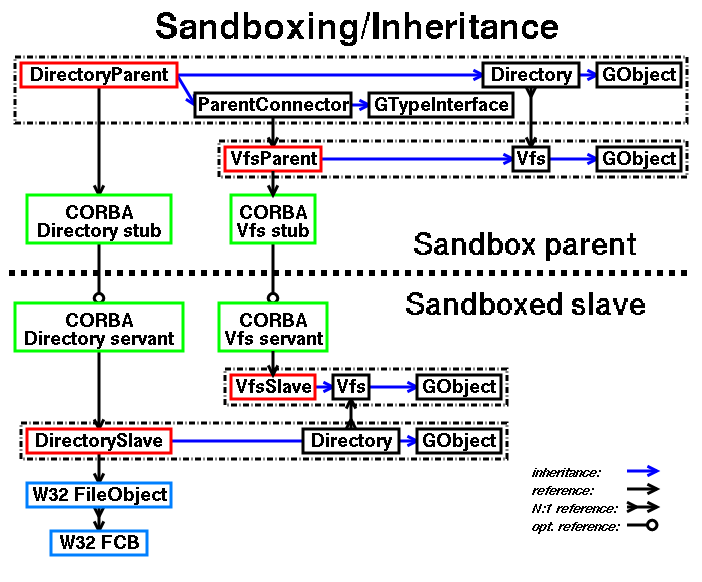 Each sandbox executing the untrusted W32 binary filesystem driver code is connected through its CORBA sandbox interface at the point of upper layer libcaptive-specific filesystem API, at the point of the bottom layer of GIOChannel device access and also for transfers of GLib logging messages/warnings/errors out of the sandbox to the user. W32 platform stands on its thorough architecture parallelism. It must lock all its objects to maintain coherence in presence of multithreading and multiple processors. Since the author of this project considers any parallel execution a serious obstacle for debugging the whole project architecture was designed to prevent any undeterministic behaviour. Therefore this projects always emulates uniprocessor Microsoft Windows NT kernel (KeNumberProcessors symbol is always 1), everything runs in the single initial thread/process and all the filesystem operations are performed as synchronous ("synchronous" by flags FILE_SYNCHRONOUS_IO_ALERT, FO_SYNCHRONOUS_IO, IRP_SYNCHRONOUS_API, IRP_SYNCHRONOUS_PAGING_IO, forced TRUE result of IoIsOperationSynchronous() etc.). For several cases needed only by ntfs.sys there had to be supported asynchronous access (STATUS_PENDING return code) – parallel execution is emulated by GLib g_idle_add_full() with g_main_context_iteration() called during KeWaitForSingleObject(). Since there is a possibility a real W32 parallel threading would be yet needed in the future all the code that would be hit by W32 multithreading capability is marked by TODO:thread comment. Multiple processors (SMP) support will never need to be implemented since uniprocessor W32 kernels apparently run the filesystem driver modules fine. As this project implements only the uniprocessor W32 kernel all the processor locking functions and structures such as KSPIN_LOCK etc. can be safely implemented as no-operations. Asynchronous callbacks registered for IO_WORKITEMs are passed as GLib idle functions by g_idle_add_full(). Although they will probably never be executed during non-interactive project's batch executions it is the responsibility of W32 driver implementation to complete all the pending tasks before its W32 shutdown. Such W32 shutdown is done during cleanup of the project's execution by captive_shutdown(). A general approach of software projects development is to implement many internal sanity checks during the development stage but to produce the most optimized final release product without those debugging checks. Facilities for these practices can be seen in the standard C include files for example as function assert() which gets disabled by the NDEBUG symbol used during the final optimized executable compilation. This project uses Gnome GLib messaging subsystem offering sanity checks discarded by symbols G_DISABLE_ASSERT and G_DISABLE_CHECKS. Microsoft also produces two versions of its products – regular customers use the "free build" (also called "retail") while the programmers should develop their code on the "checked build" product releases. As this project will always run unknown binary code of proprietary W32 filesystem drivers, the code can never be trusted. Such code even runs in the same unprotected address space as its controlling UNIX code. Since there is not enough documentation for the W32 components of the system and also such documentation is usually misleading it can never be considered as 100% emulation. Even in the final releases all the sanity checks implemented in this project should remain active as all the project's code always interacts with unknown and untrusted W32 binaries. Microsoft Windows NT code is written in a foolproof style as it accepts even invalid input values, and which it usually corrects. This makes long-term debugging a pain as it hides sources of problems. "Checked build" releases were probably designed to fix this flaw by strict consistency checks but it did not reach its goals as such checks are usually missing in the code. Last but not least – never miss a possible sanity check as its later removal is in an order of magnitude cheaper than an uncaught invalid assumption. Failed assertion is not always a bug although it has to be fixed, of course. After writing approx. 1MB of data on NTFS test partition NTFS driver returns for any further write requests STATUS_LOG_FILE_FULL error code. Apparently it is caused by the fact this project is single-threaded and it ignores the spawn of parallel journalling thread during ntfs.sys initialization. Fortunately ntfs.sys will clear its journalling log file during filesystem unmount. This project will therefore remount the volume if STATUS_LOG_FILE_FULL is detected to workaround missing journalling thread. Similiar behaviour can be seen during write of compressed files — the file gets written uncompressed and its compression will proceed only during the final filesystem unmount. For these reasons it was mandatory to support transparent volume remounting. The sandbox master component of this project has control of restarting its sandbox slaves containing the W32 filesystem. 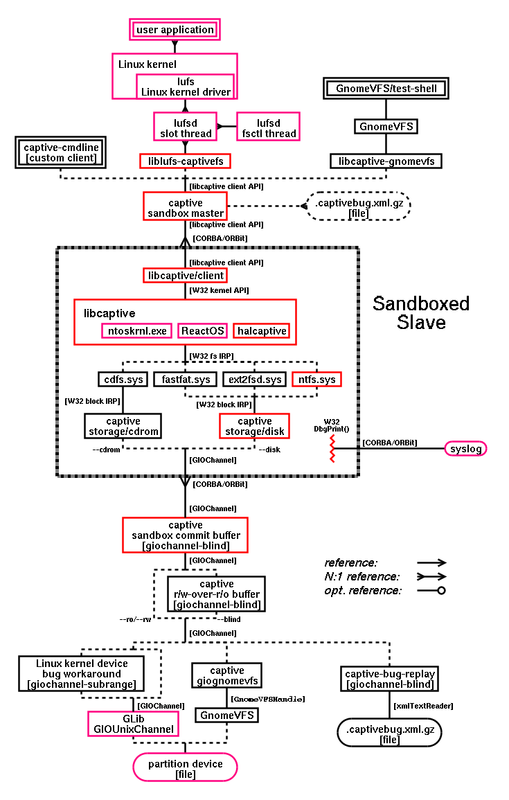 Target goal of ParentConnector component is to transparently provide persistent view of files and directories over the sandboxed slaves being restarted. message to syslog and refuse any further operations with this object. HANDLE represents W32 object open in existing W32 filesystem.HANDLE is created on-demand according to the saved state of the object (such as its pathname). Even the whole VFS sandbox slave is spawn on-demand if some object operation requests it. W32 filesystem crash can obviously occur at any moment - it generates GObject signal abort. Successful filesystem unmount (even as the part of remount operation) must be first preceded by detach signal to close all existing W32 HANDLEs. After their close the filesystem gets the unmount requests. Only in the case all the close operations succeeded including the final filesystem unmount the signal cease can be activated to notify all the dirty (written) objects they are now clean. During this cease signal the project will also flush the sandbox commit buffer to its underlying media. Objects never written remain in clean state and they can be transparently reopened even if W32 filesystem crash occurs.